A Matter of Memories: :SALES: Great discount at Scrapbook.com ... TODAY only! :SALES: Great discount at Scrapbook.com ... TODAY only! Shop for your favorite scrapbooking supplies today! 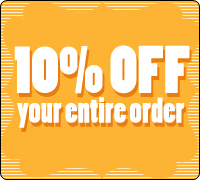 Scrapbook.com is offering 10% off your entire order TODAY only! This discount applies to sale and clearance prices. Simply enter coupon code tenaugsave in the coupon field at checkout and 10% will be automatically deducted from all items in your shopping cart. Hurry - this offer expires at midnight PST.